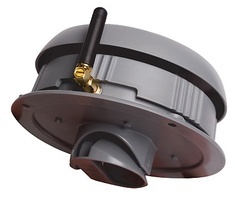 ​The T110 Tank sender unit easily pairs with any Aquatel D110 Multi-tank capable system, see D110. You can pair up to six Aquatel T110 Tank Senders to any one D110 display. These have a standard working range of up to 300m (1000 feet) line of sight or when used with our Aquatel AQ920-7 custom booster antenna systems, you can achieve up to 6 miles (10 km) line of sight. You can have trees, buildings, concrete walls, floors etc between the Tank and Display units, however every obstruction will shorten the working radio range. See Booster Antennas.